DYNAMICS. What does that word mean to you? In Physics, it means movement or motion. That is exactly what I intend for it to mean here, because the dynamics in Panama are absolutely DYNAMIC! I’ll share with you just some of what is going on that is so exciting! Talk about dynamic and spectacular: Year-end in Panama is something else! This year, we did not plan a festive party with a fancy dinner,served by attendants dressed in tuxedos with a grand orchestra playing and French champagne flowing at midnight. No. 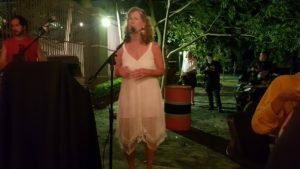 We had a simple but elegant dinner at the Tiki Bar right here in Gorgona–a sandy spot right on the beach where, once a week, Norma sings at open-mic night and we enjoy the cameraderie of friends and acquaintances. We decided that we would rather not get out on the highway on New Year’s Eve, which led us to our decision to have dinner right here in Gorgona. The food at the Tiki Bar is always very good, but they totally outdid themselves on New Year’s Eve with a fabulous 4-course dinner with champagne (not French). The owners and their young team were very polite and energetic and engendered an atmosphere among the huge crowd, who were friendly and joyous in anticipation of another terrific year in Panama. 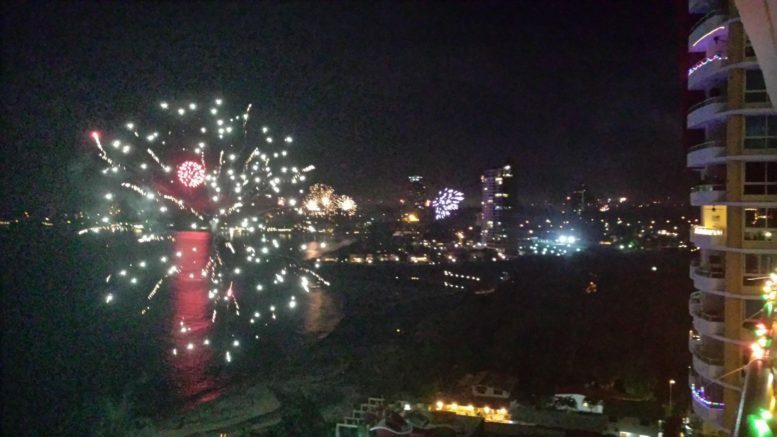 Fireworks in Panama are something completely apart. In short, Panamanians LOVE fireworks. On New Year’s Eve, the fireworks began well before midnight and continued nonstop for nearly an hour! Spectacular fireworks! A total panorama of fireworks all along the beaches and inland. Our view from the 13th floor condo of some friends who live at Bahia, the high rise that neighbors the Tiki Bar, gave us a breathtaking view, as far as the eye could see. I’m not usually awed by fireworks, but this time WOW! The quality of the light show was first-class! It was almost as amazing as the lightning shows we get over the Pacific during the rainy season. The fireworks and bubbly kept me wide awake long after midnight and I actually got pretty excited thinking about what the coming 365 days will bring. I am thinking about the dynamics I feel, being in this peaceful country of Panama. This is a similar to what I felt when I immigrated to the United States in the last century. The excitement about the possibilities, the changes, the opportunities! At this moment in the history of the world, Panama is one of few countries that is experiencing continuous economic growth. In fact, for more than 15 years, the annual economic growth rate of Panama has been over 6% on average. Add to that a steady annual reduction of the poverty rate in the country and you have a pretty remarkable place! This dynamic in Panama was most likely begun with the transfer of ownership of the Panama Canal from the US to Panama in 1999. In fact, that momentous transaction was responsible for the movement in many directions in Panama. 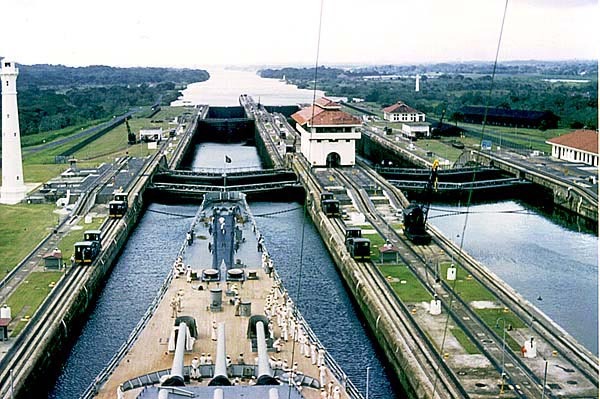 Instead of a “Thanks, Partner” from Panama and resting on the perennial laurels of the Panama Canal, the government of Panama set about approaching the operation of this Canal like energetic professionals. They understood that the Canal had limited capacity in a changing shipping world. They saw the trend to larger vessels and envisioned a third set of locks. That vision led to years of hard work and a $5 billion plus tab and the opening of the new expansion locks on June 26, 2016. 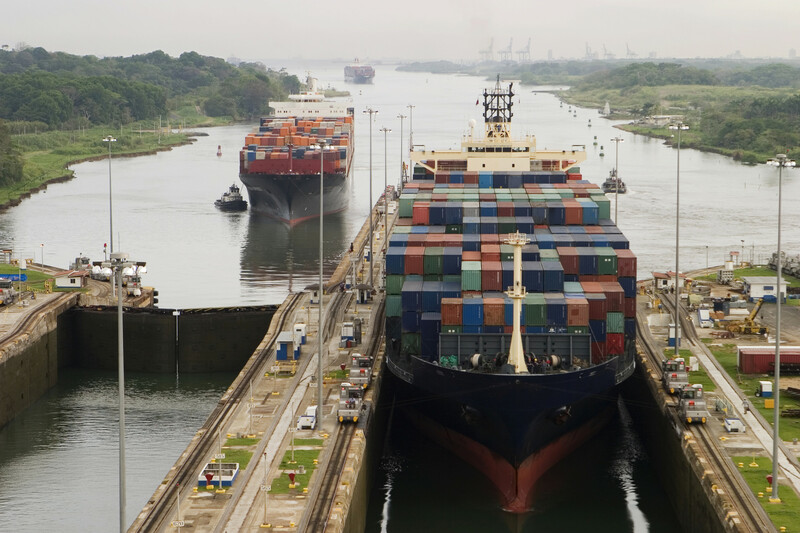 The Panama Canal now has the ability to accommodate 79% of all cargo-carrying vessels, including the Post-Panamax ships. This expansion of the Canal was the right decision in light of growing worldwide shipping. It was not an easy decision to put such a huge amount of money into just ONE single project. This, of course, was not the last improvement to the Canal. 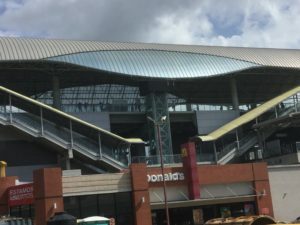 Future expansions are already in the pipeline and new ventures in connection with the Canal are opening up and are in full swing. 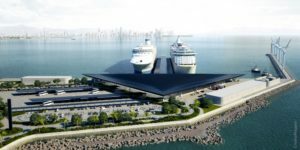 Wednesday November 1, 2017 was another eventful day for the people of Panama and for millions of tourists from around the world: Construction of a cruise ship terminal on the Pacific side of the Panama Canal was started. This $166 million Port Facility will go up on the amador Causeway on Isla Perico. The construction is being done by a consortium of Belgian and Chinese engineering companies who have had a presence in Panama for several years, working on the Panama Canal expansion. The impact of this Terminal will be very substantial. There will be at least 1,100 direct and permanent jobs created plus an additional 1,800 construction jobs. This new Terminal is projected to bring more than 600,000 tourists to Amador, i.e. Panama City, in the first year. There will be two berths at the Terminal, which allows for 2 ships carrying 5,000 passengers each to dock at the same time. 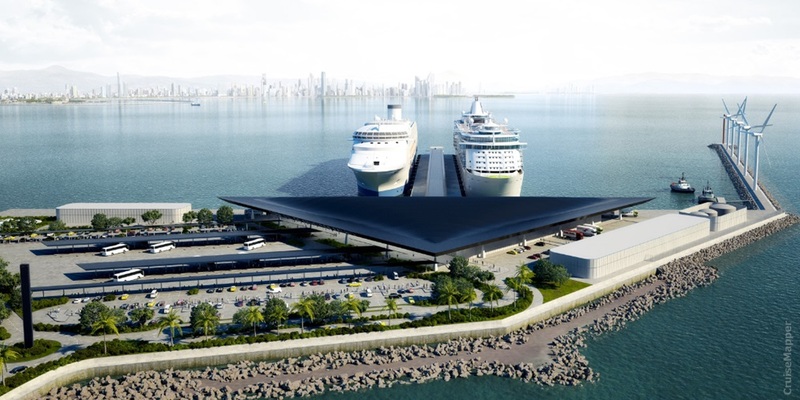 There will be facilities to make Panama an easily accessible destination and home port on the Pacific. This will allow travelers to take different routes and spend time in the city, greatly increasing the contribution to the national economy. Amador is prepared to welcome and accommodate this future influx of tourists. Will the cruise ships be an asset for the Panama Canal? Cruise ships are levied a fee of $134 per bed to transnavigate the Canal. So, for instance, a cruise ship with 5,000 beds would pay a fee of $670,000 to go through the canal! Cargo vessels are levied a fee of $82 per loaded container and $74 per empty container. The load is normally 4,500 containers per vessel. You can access additional details about Amador from our November 17, 2017 newsletter/blog. 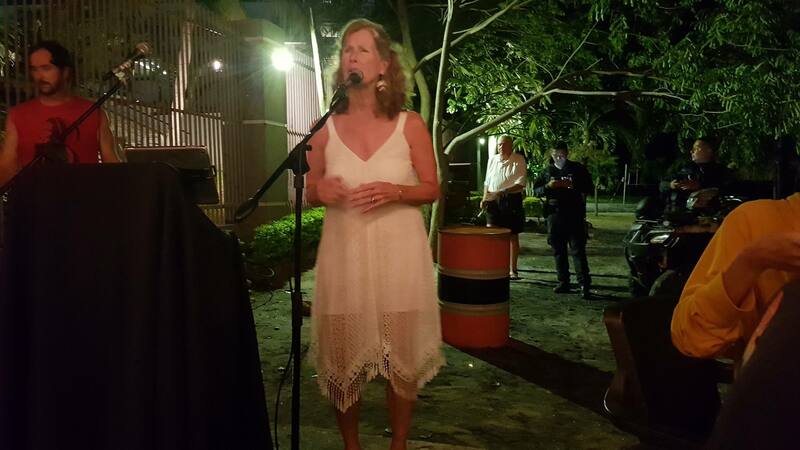 Centennial Celebration: Just one side note, but directly connected with this maritime business: In 2017, Panama celebrated one hundred years of International Registry of Ships. Now, the greatest number of ships worldwide fly the Panamanian flag! The dynamic of Panama is a direct result of all of the capital projects this country is planning and realizing. From the traffic on the canal, let’s go now to the Panama City traffic. As happens in many major cities in Central and South America, traffic is, at best, difficult and, at worst, a catastrophe! Panama City is no different. The city streets were not laid out on a grid system, have no master plan to ease flow of traffic and simply are not designed to handle such a heavy traffic load. Forward-thinking movers and shakers saw this as an opportunity and introduced THE METRO, a huge project to take more of the traffic off the streets and to move greater numbers of people in much shorter times. The Metro is and will be above ground as well as underground. 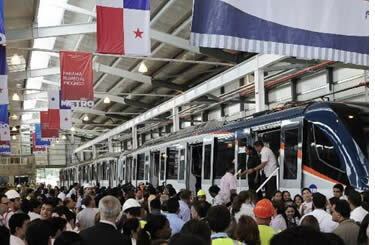 We personally were witnesses and victims of the construction for Linea 1 of the Metro nearly five years ago. The construction areas were so chaotic and chopped up that, at one point, we decided that, rather than try to negotiate strange detours and backups, we should drop off our rental car and hire a cab (cab drivers always know where to get around the snags) in order to catch our flight in time! Linea 1 of the Metro is a North – South connector which goes a length of 16 kilometers with 14 stations. 6 of these stations are elevated and 8 are underground. All trains begin at Albrook Station, which is the national and international terminal for buses as well as the hub for The Metro. Linea 1 was launched April 6, 2014 and was designed to move 15,000 people per hour. Panama is not a country of limits…today this line moves 280,000 users on average per day! When I was working in a downtown office last year, I used the metro on a regular basis. The riding experience comes close to the subway in Tokyo: a place of intimacy due to the huge crowds in the tiniest spaces! Linea 1 was developed without taking away or occupying any street capacity. Only underground and elevated spaces have been used for the construction. Because the Metro uses electricity for power, it does not emit any polluting gases and does not affect environmental conditions in the city–except by improving the air by eliminating some of the cars! Also, automatic control systems prevent collisions between trains. Linea 1 was built at a total cost of $1.452 billion. 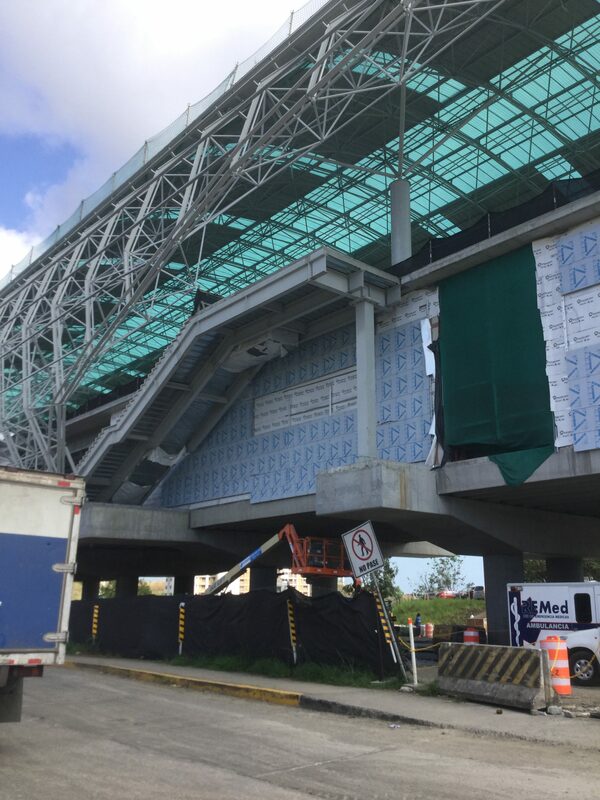 Linea 2 got started with construction in September of 2015 and is due to be completed in December 2018. It will connect Tocumen International Airport with the downtown and Albrook Terminal. In Spring 2019, Panama City will be the location of the Catholic World Youth Summit, during which Panama City is expecting more than one million tourists! The importance of this line in moving these big crowds of tourists around the city cannot be understated! As you can see, the relatively small country of Panama (population 3.5 million) is not just making huge investments for nothing. It is utilizing the newly created infrastructure to increase the country’s income by organizing and hosting events. Linea 2 is important for getting tourists from the airport into the city, but also to move the huge and still-growing population in the Chanis area into the city. The areas around Chanis (population 750,000+) are rapidly growing and the road systems are insufficient for the load: People spend an average of 90 minutes on the road just to get downtown or from downtown back to Chanis. Residents of this area are eagerly awaiting the inauguration of Linea 2 of the Metro because the commute will shrink to just a few minutes at an extremely economical cost. Its own exclusive route will make it the fastest possible route into the downtown area. 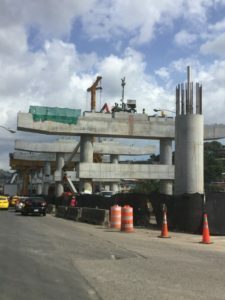 Linea 2 is being built at a cost of $2.2 billion and helps to put Panama ahead of many other countries for ease of transportation. 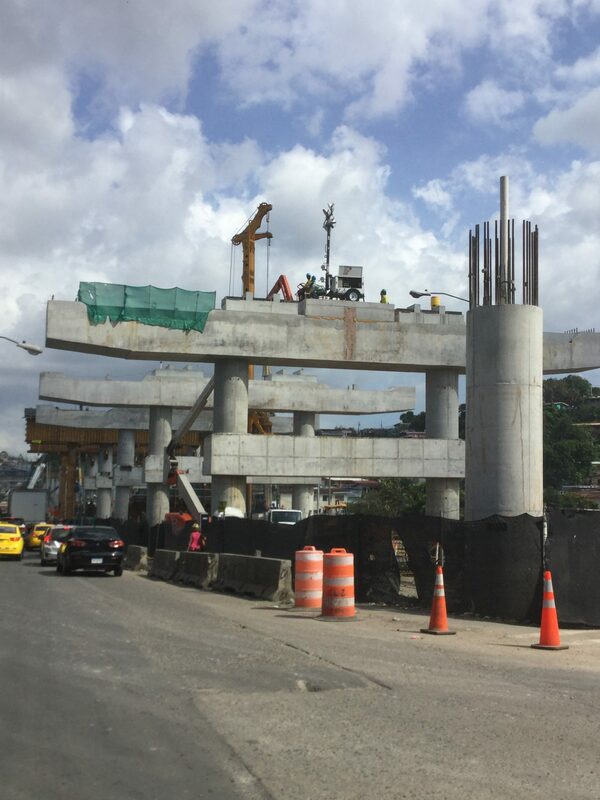 In the pipeline for Panama: Linea 3 of The Metro! Stay tuned for our upcoming newsletter that will introduce Linea 3 and many other new capital improvements in Panama! DYNAMIC ORGANIC FRUIT FARM NEWS – Changes for 2018! 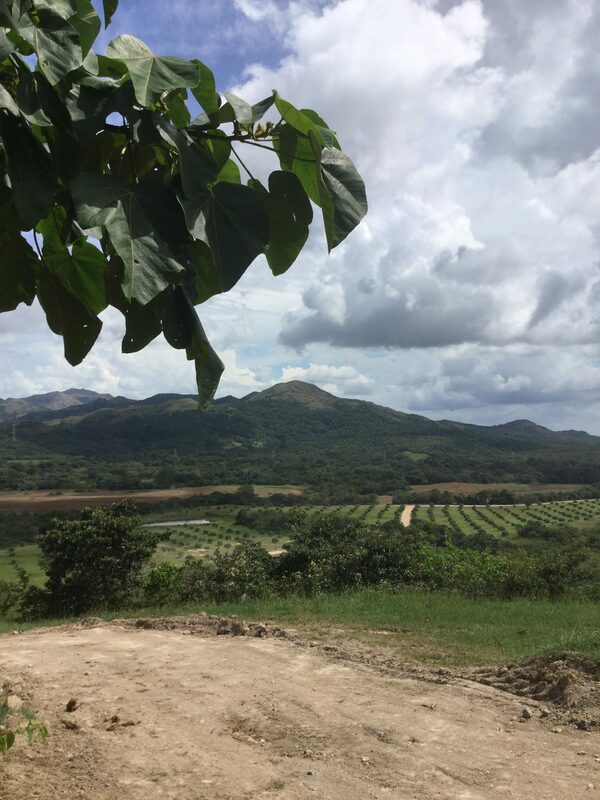 Managed organic plantations in Panama are one of the best opportunities for Income-Producing Impact Investments worldwide. The income for the investor beats any kind of investment on this planet. I know. There are people who think nothing can beat Bitcoin. But I am talking about REAL INVESTMENT that earns CASH income year after year, far above 10%, as well as the appreciation of the asset itself and growth of income. And this is not for just a few years, but as long as you hold it! In fact, it is likely that your investment has a much longer production cycle than you have years around on this planet. And after that, it can be a legacy for your family or charity! In addition to satisfying your appetite for income, this investment provides for the community, as well. Hundreds of people are being educated in these communities and trained for new jobs. They receive help for better education for their children. This leads to people who are invested in taking good care of your investments because they are their investments, too! 2018 has brought some significant changes to the Organic Farm scene. As we had anticipated, without knowing just when, December 2017 brought an end to the offering of the Organic Mango and Organic Hass Avocado farm offerings. These have been extremely successful over the past 4 years, but all good things come to an end. They are simply not selling any more of these. However, there is still a wonderful opportunity for you to become an owner of a very profitable organic fruit farm in 2018. The new offering is exciting and is offered in the same format as the mango and avocado, that is, you own the land and produce and it is professionally managed and totally turnkey for you. Turnkey: think about that word. Essentially what this means to you is that, after purchasing your farm, your work and investment is done! You simply watch your investment grow and cash the checks you receive from the harvest. Passive Income: income that you receive from an investment that you are not required to work for or continue to invest in. Low Risk: stable investment in a real property and agriculture. This term is music to the ears of most folks who work hard for their money and don’t love the idea of seeing it vaporize on Wall Street. These are three rare characteristics of great income-producing investments and yet are so valuable to each and every one of us. An investment that provides income without decreasing the value of the investment itself. Totally essential to your portfolio. Watch for a special report on the new farm offering, coming in the next couple of weeks. If you just can’t wait, contact us now and we will provide you with details. If you missed the mango and avocado, don’t let this one get away. As always, if you have comments or questions regarding these topics or any others we have addressed in the past, please comment here or send us an email to fpb@AnAmericanInPanama.org. We love to hear from you! Be the first to comment on "Dynamic Dynamics in Panama"